New Delhi: Ram Nath Kovind was on Tuesday sworn in as India’s 14th president, the first BJP leader and the second Dalit in the Rashtrapati Bhavan. The 71-year-old took oath in Hindi to thunderous applause and thumping of desks by the gathering, including Vice President Hamid Ansari, Lok Sabha Speaker Sumitra Mahajan, Prime Minister Narendra Modi, outgoing President Pranab Mukherjee and former president Pratibha Patil. Former prime ministers Manmohan Singh and H D Devegowda, UPA chairperson Sonia Gandhi, former Lok Sabha speaker Meira Kumar, former deputy prime minister L K Advani as well as Union ministers and foreign dignitaries were also present on the occasion. After he took oath, Kovind was given a 21-gun salute to mark the assumption of office of the highest constitutional post in the country. 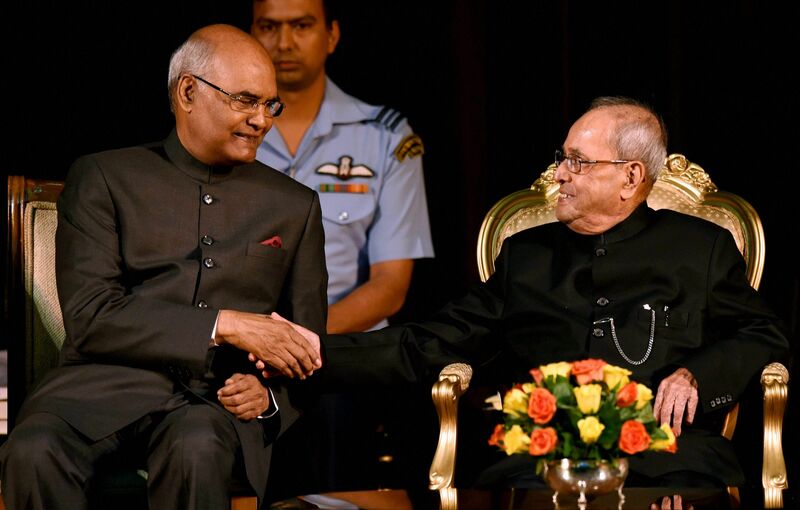 Once the oath taking was over, Kovind and Mukherjee exchanged seats on the dais after which the new president delivered his maiden speech as president. Kovind was elected with 65 per cent of votes defeating Meira Kumar to occupy the top post. The 71-year-old leader born in Kanpur, Uttar Pradesh, had also earned the support of the JD(U), which broke ranks with the “mahagathbandhan” because of his non-confrontational approach as governor of the state. A commerce graduate, Kovind studied law at the Kanpur University, practised in the Delhi High Court and the Supreme Court. He was also the central government’s standing counsel in the apex court from 1980-93. Kovind, who headed Dalit Morcha from 1998 to 2002, also led the All-India Koli Samaj. Elected to the Rajya Sabha in April 1994 from Uttar Pradesh, he served two consecutive terms till March 2006. Outgoing Mukherjee bows out of public life after a five- decade political career.